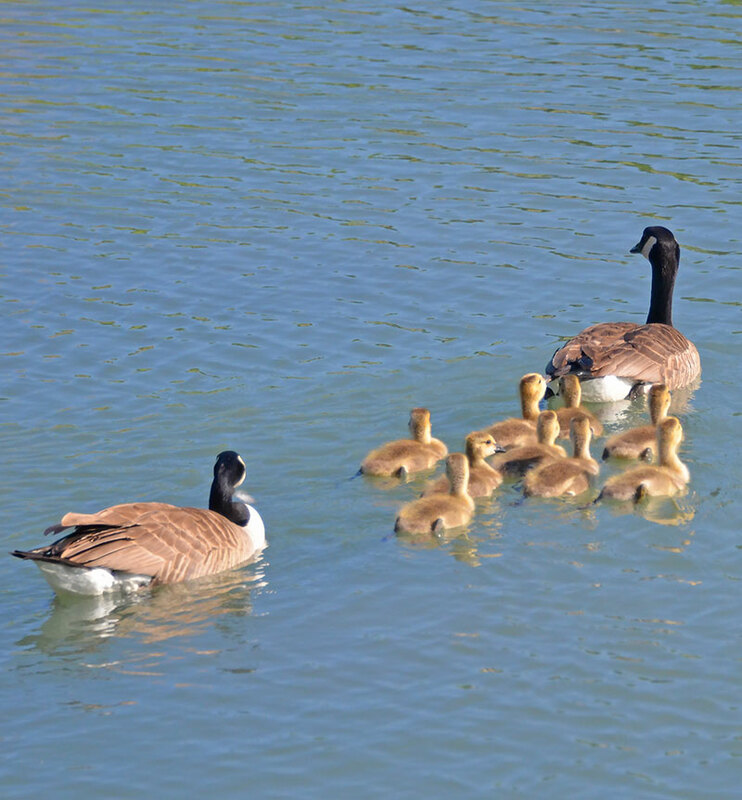 Yes the geese make a messy problem, but killing their offspring amounts to animal cruelty. It is sad when wildlife has fewer places to raise families and it keeps getting smaller with each passing year. With geese, it is the excrement problem as the goose droppings anger golfers and town residents. 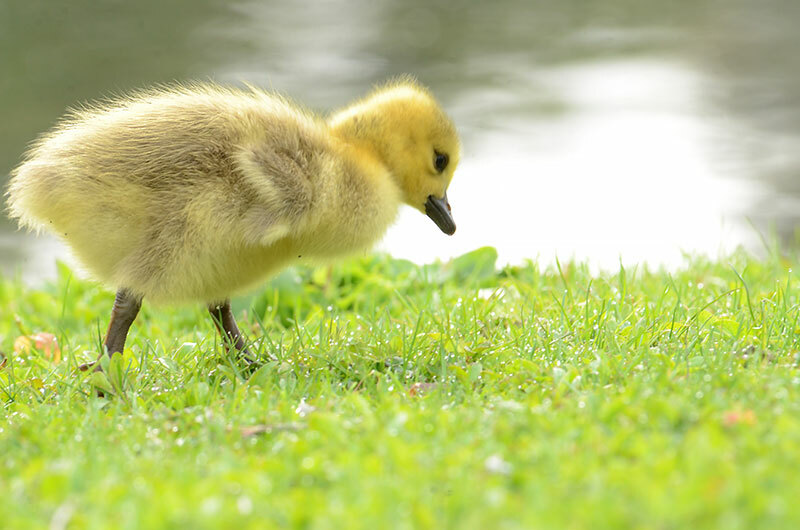 At the local airports, the geese became desensitized to air cannons used to scare them away and they had to hire a wildlife specialist at the Buffalo Niagara Airport to control geese and groundhogs. I am not sure what the specialist does for control though. Solar-powered strobes were used locally as well in some places. Even one community put a fake alligator head in Ellicott Creek to scare the “interlopers”. One town conducted programs that “disrupt” nests or even oil eggs to prevent them from hatching so as to cut down on the goose population. Another uses border collies to chase geese. It really is a terrible life for the geese. Some places shooting them is allowed during hunting season. Even our local nature preserves are ridding the parks of geese. Is that not what preserves are for, a safe environment for wildlife? So what a boater or duck hunter steps in the green excrement. I bet if the geese laid golden eggs the sportsman would not be so retaliatory to the geese. When they have babies they will do anything to defend them and become very aggressive. Wouldn’t you? Not only is shooting them cruel, unlikely it’s going to work. 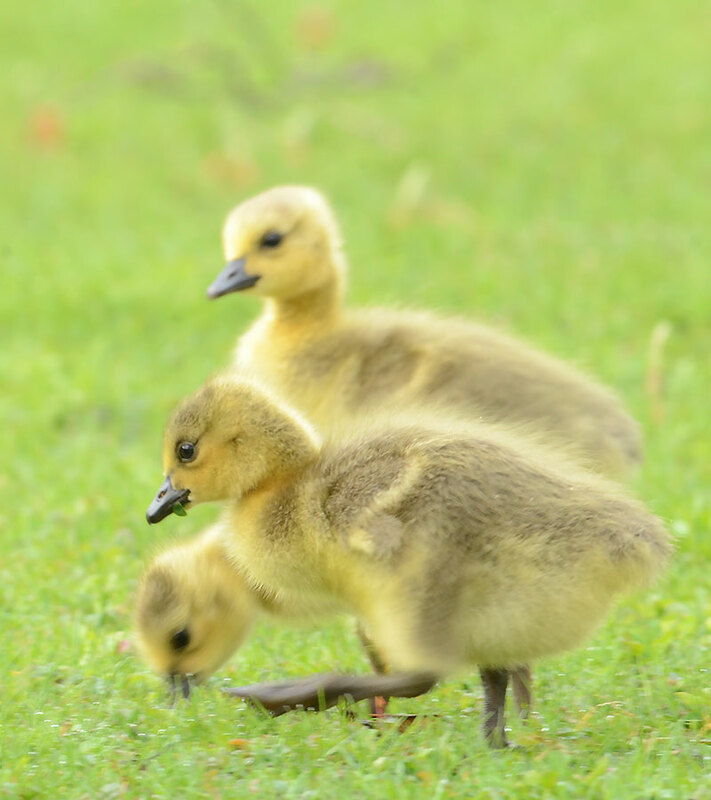 The remaining geese will breed more to produce more goslings. That’s what nature put them here to do. The number of the geese is not so much the problem as development has caused encroached on the land they have been using for generations. 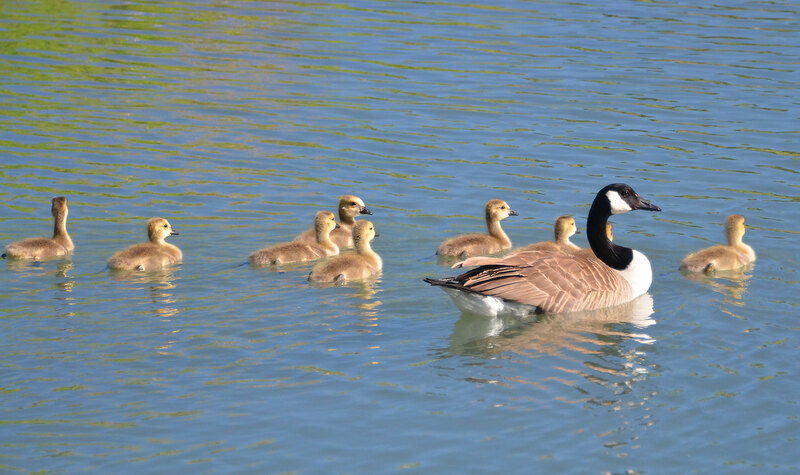 The problem is us and our goose attracting development, not the geese. There are too many of us! It makes you wonder if the goose control tactics would work on people and how long they would put up with it? 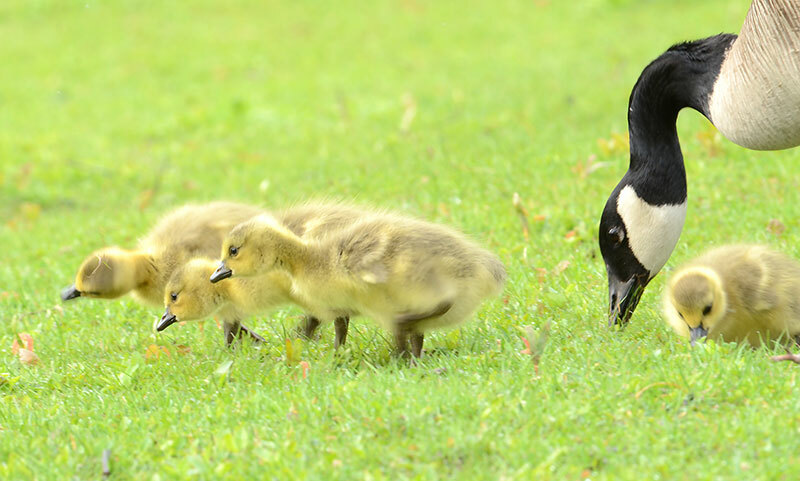 This entry was posted in Birds, Nature, Nature Preserves, Photography, Photos, wildlife and tagged baby Canada geese, Canada Geese, Canada Goose control tactics, goslings, killing Canada Geese. Bookmark the permalink. I believe everyone knows they are a nuisance, but it is not their fault they are here or use areas we deem for humans only. Killing them is inhumane, no matter what the humane society says. Just my opinion, but I am sure other animal lovers feel the same. the the geese are a nuisance, it goes on to say that killing the animals is not condoned and gives some great advice for dealing with goose populations. Thank you for giving those precious balls of feathers a voice. I feel for all animals unnecessarily persecuted by humans. I know we raise them to eat, and animals eat each other, but we kill these geese for our recreation like on golf courses. I understand that air safety is an issue, but people get far more alarmed when it is a snowy owl getting killed at the airport than a lowly Canada Goose. I feel the same way… humans seem to think that ‘we’ are entitled to everything, whether its clearing trees for a better view or shooting birds that poop too close to the house 0r – whatever… they all deserve their rightful place…. Your silence worries me… suffice to know that I’m thinking of you and hope that you’re getting better…. Oh Donna, you have the photos when they are so young and so adorable! I have heard of oiling the eggs so they don’t hatch but “killing the babies? !” We should fine the people for their excessive feeding habits and disregard for the rules and use the money for education and park maintenance..Despite fake coyotes and falcon calls and lazer beams at nest sites as well as chaser dogs, the geese have proven they are competent survivors! That is one thing to admire about the geese, they are survivors. Sadly they cause such headache for parks and golf courses. Today I walked past a hen on her nest of dead babies. She has been sitting on them for many days straight, and likely will die right there. I have no idea what killed the babies, but this is incredibly sad. 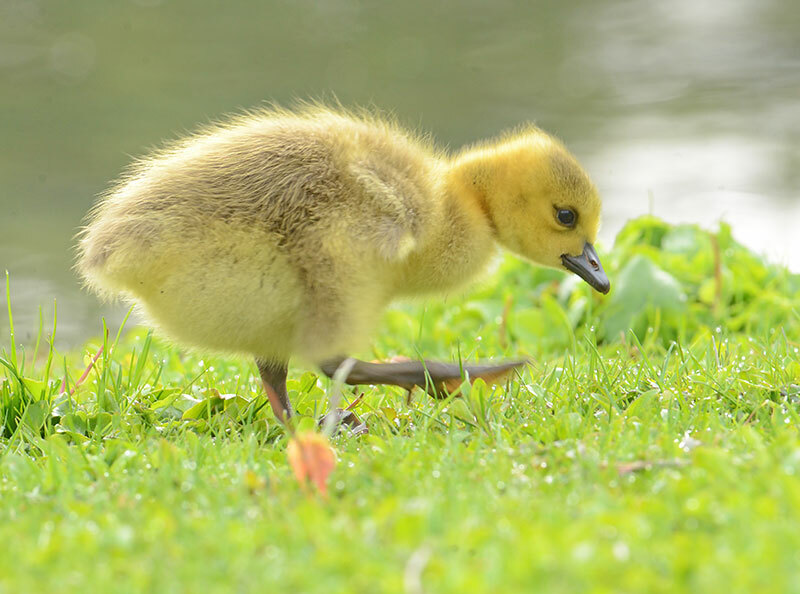 Beautiful photos of the goslings Donna, but so sad to read once again how humans show disregard and disrespect for wildlife. It happens all over the world unfortunately. We humans develop the land excessively in such a way as to cause problems for the local animals and then complain when the animals become a nuisance to us when they are only trying to adapt and survive in an ever changing environment that is out of their control. Likewise we have several bird species deemed pests due to their large numbers and over. Feeding in proportion to other native species, these are mostly introduced birds from Britain. Interesting that these greatly multiplying birds stay mainly in city areas where they thrive on human association whereas the forests and natural parks have our native species. Around here in South Dakota, we would be stripped of our hunting rights for a time if we did any of this to Canadian Geese in the spring. Send them over here, I love nothing better than to hear them in the evening and the morning. I feel exactly the same way, Donna. We take over most of the land so there’s not enough left for the wildlife. Have missed many of your posts and trying to catch up. Yes, it’s cruel and there just isn’t the space for wildlife thanks to our species. Hope all going well for you. Thank you for the great pictures and your post here. Humans have shown a lack of respect for wildlife and if we continue to do that then surely one thing and then we will have to suffer the worst of it. Donna, I have thought of you so many times and hope that you’re pulling through the health challenges. No news is not good news. If you’re able to be online, suffice to know that you are missed….